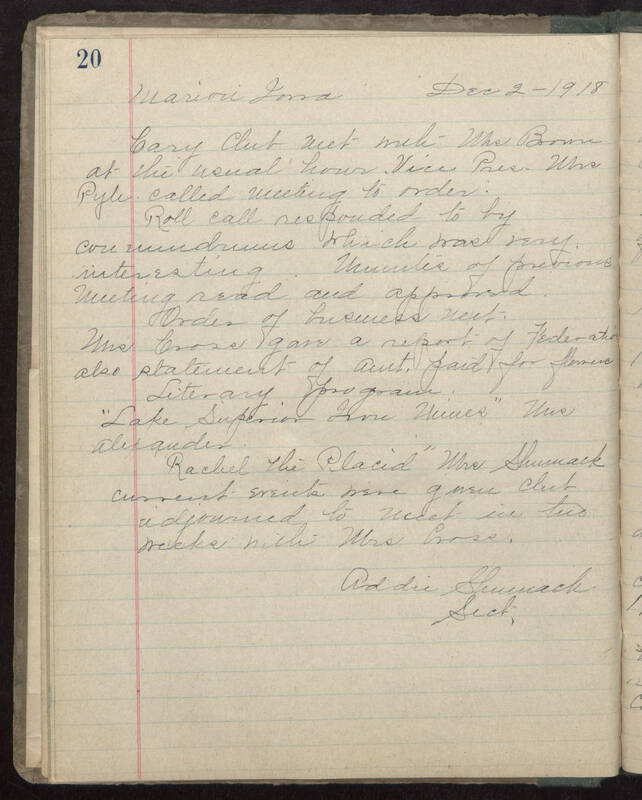 Marion, Iowa Dec 2, 1918 Cary Club met with Mrs Brown at the usual hour. Vice Pres Mrs Pyle called meeting to order. Roll call responded to by conundrums which was very interesting. Minutes of previous meeting read and approved. Order of business meet. Mrs. Cross gave a report of Federation also statement of amt. paid for flowers. Literary program. "Lake Superior Iowa Mines" Mrs. Alexander. "Rachel the Placid" Mrs. Shumack. Current events were given club adjourned to meet in two weeks with Mrs. Cross. Addie Shumack Sect.